have just dropped a stunning new single and video for Bitter – https://youtu.be/5bc8AEVlUHY , which has been taken from their hugely anticipated self-titled EP, which arrives on Friday 19th April. We had a chat with the guys and got to know them a little….. The full line up is Celyn Beynon on Vocals, Aaron Hammersley on Lead guitar, Ched Cheeseman on Bass & Jonno Smyth on Drums. How and when did the band form?. 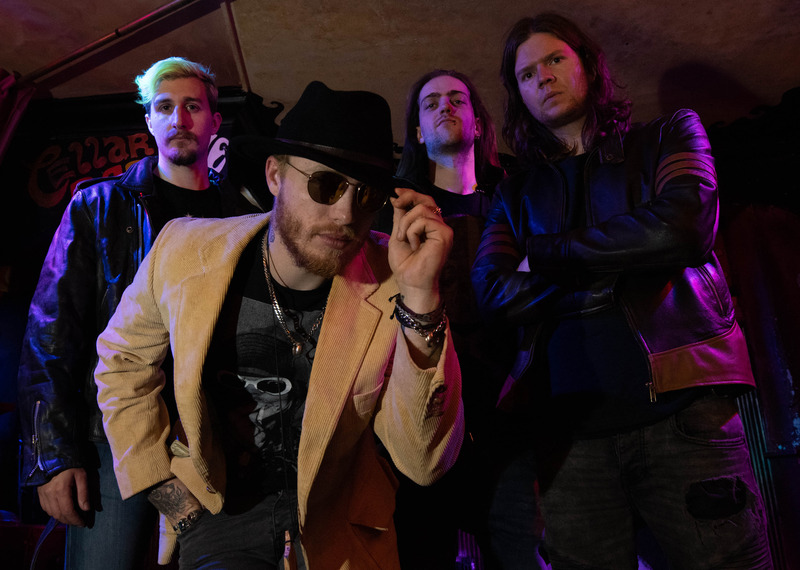 The band formed back in October 2017 with drummer Jonno Smyth & Guitarist Aaron Hammersley in the south coast town of Bournemouth. They quickly established a repour with each other, then adding in Vocalist Celyn Beynon & bass man Ched Cheeseman they had a formula for something special. Writing 5 songs for a debut E.P in just 2 weeks and establishing a reputation for one hell of a live show…. The stage was set for the beginnings of BTV. The band really started Gelling after our first few live shows, we realised we had something really special with the delivery of our live show. The feedback we were receiving and the fans we were gaining told us that we were one of most energetic and fresh sounding bands they had ever seen. It was around half a year into our career that we felt that we had a really solid sound and backbone to build off of, taking more care with song writing and pushing ourselves creatively that little bit further! Iron Maiden, Black Sabbath, Shinedown, Metallica, Bob Dylan, Black Stone Cherry, Led Zeppelin, Queen & Megadeth. We’re not entirely sure, believe it or not. We had a few names floating around such as Metalkil & Yhcrana… But we all felt that Black Tree Vultures rolled off the tongue really nicely and we thought it sounded pretty darn cool, it fit with our style of music and our general image so we thought…. PERFECT! Aaron & Jonno have known each other for years, performing In a previous band together back in their teenage years. Celyn & Ched were introduced to them through the miracle of music… Everyone established a very good repour fairly quickly, we were all united by the same cause and inspired by similar music so it felt extremely natural. The band have performed all across the UK supporting the likes of Devilskin & Snakecharmer. We have also been lucky enough to perform across Europe in countries such as Germany, Holland & Belgium. We are inspired by Maiden and Sabbath heavily so you can hear the roots of that in the music we create, but our vocalist is heavily into his Bob Dylan and he adds a very distinct style of vocal to the music making it very unique and refreshing. There aren’t many bands that sound like us and we love that we have individuality in such a crowded market. We head off to Europe for a small tour in February, appearing at a few regular touring spots in Germany, Holland and Belgium as well as an appearance on a Dutch radio show “On The Rocks”. We’re going everywhere we can!